Pegs to hold it together while glue dries. 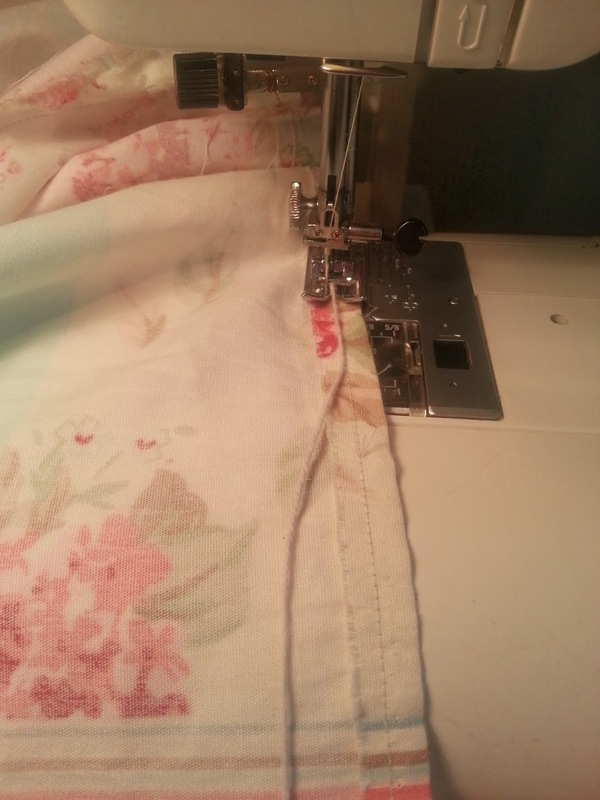 Sew the two narrow ends, right sides together to form a loop. 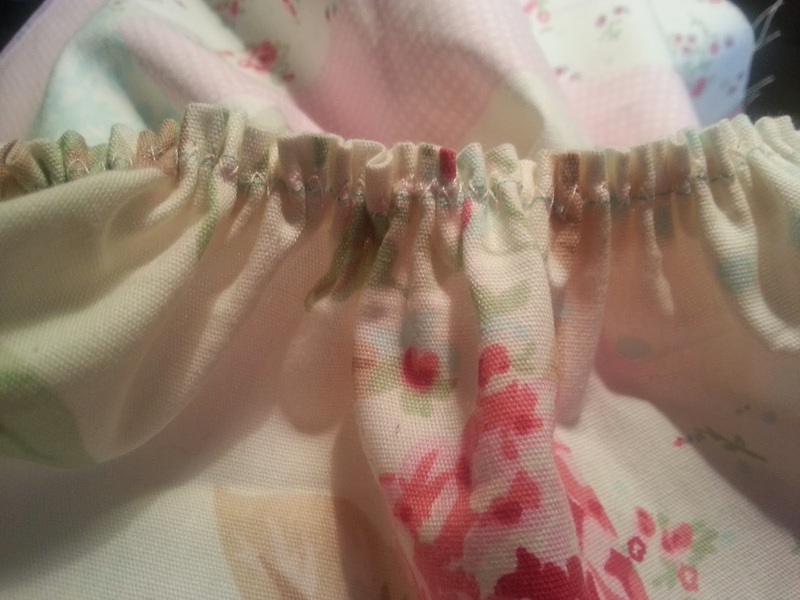 Fold over and sew a 1/4 in seam all the way around (the long edge). 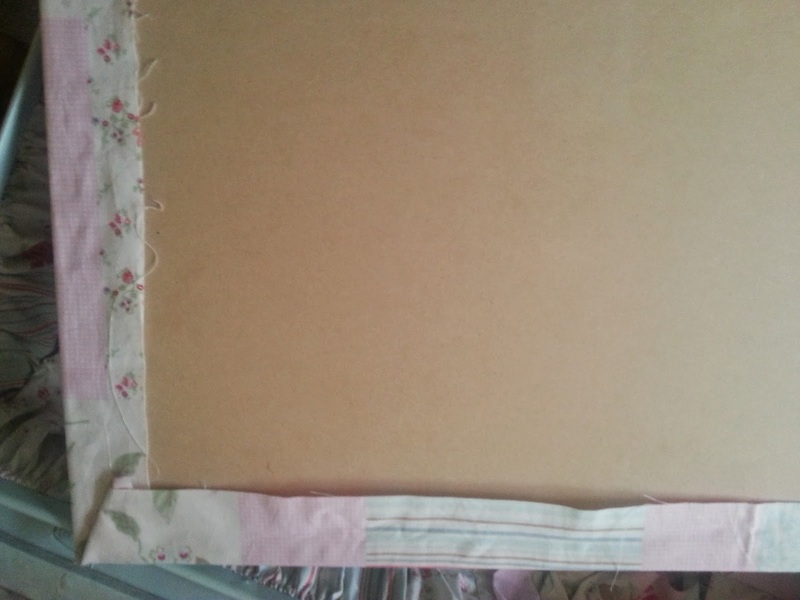 This edge then needs to be gathered using either a gathering foot, or a gathering stitch. 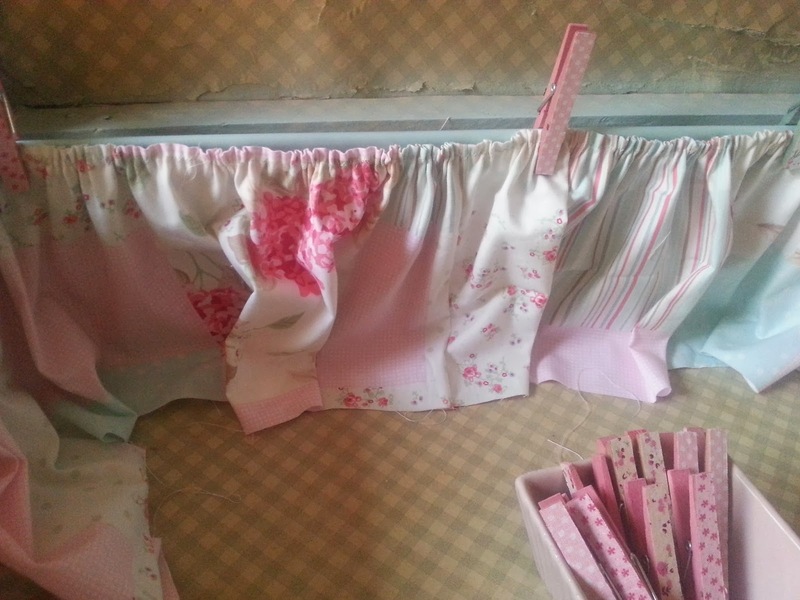 This is optional: If you have enough fabric you can make a matching bow. 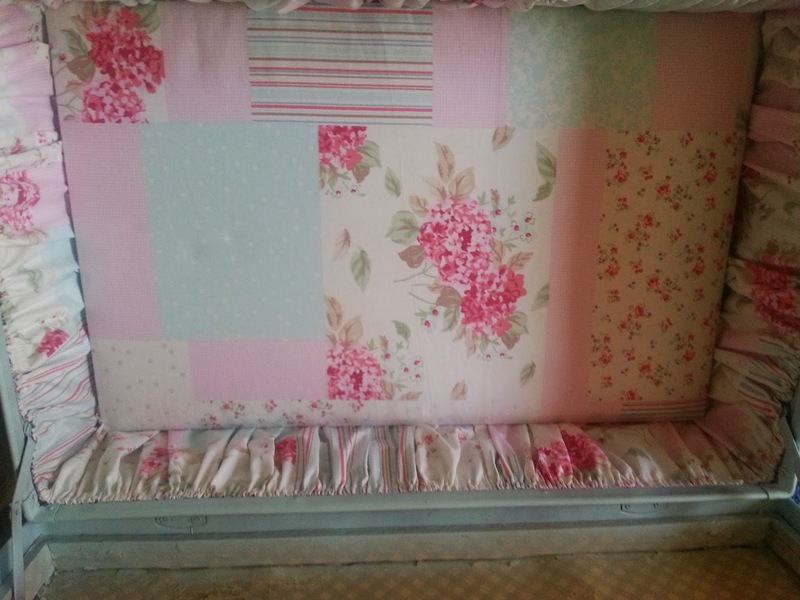 Cut a strip of fabric 75 cm x 7 cm. 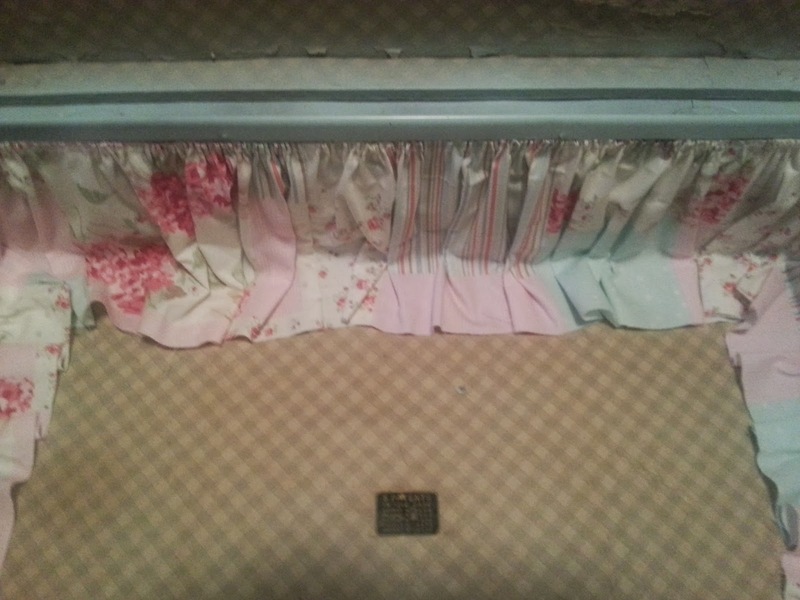 Press under a 1/4 seam all the way around including narrow edges and sew. Tie bow to handle. 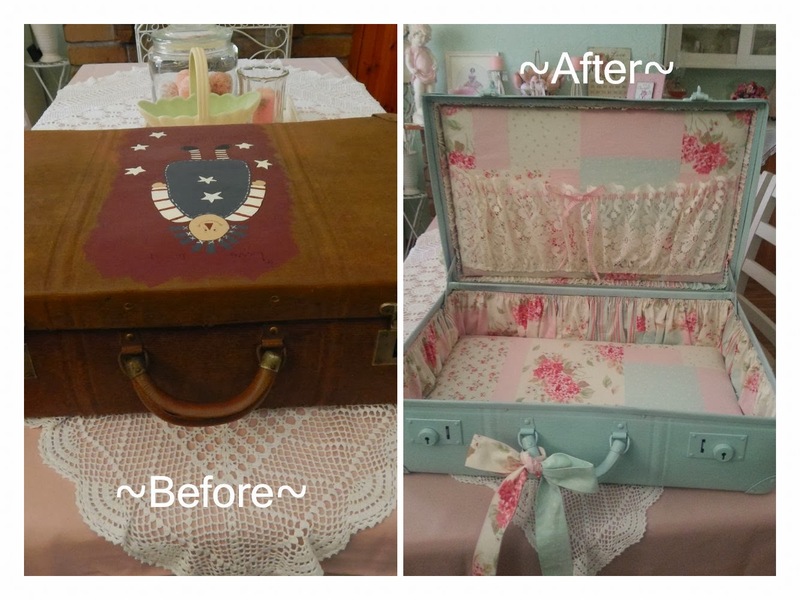 Love this idea and going to have a go myself...just need to find myself an old suitcase :) Thank you for the tutorial. Your welcome Pam...I just hope you can follow my instructions. What ever was I thinking, I found the button for tutorials, please disregard my first comment. Thanks for a neat idea. Great tutorial. Thank you. Also love your blog background and all the embellishments! This is a fantastic tutorial and just what I've been looking for since I just purchased 2 suitcases that look really boring. Thanks for the inspiration! This was fantastic! I always wondered how to do the gathers. I even tried once. It was a failure....Thanks for sharing this. Thank you so much for this tutorial. I made this case and I absolutely love and adore it. 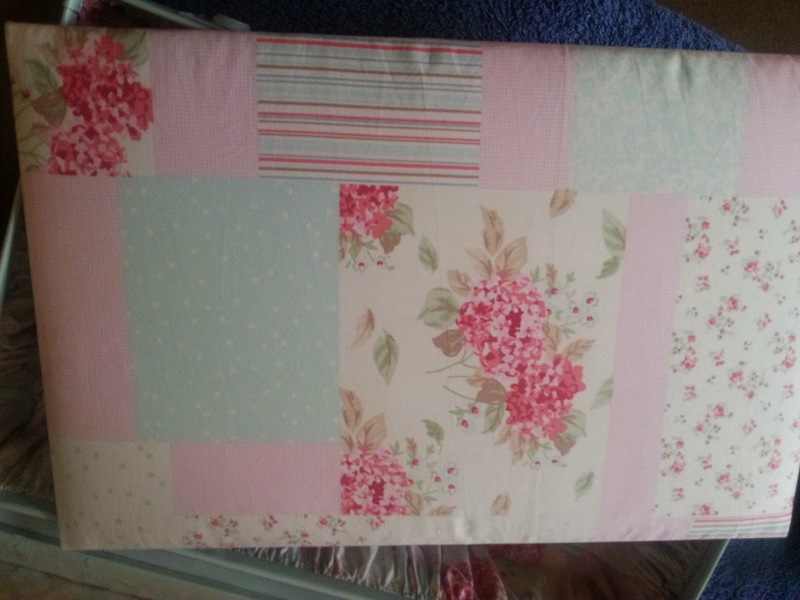 I had to make my own patchwork as I didn't have suitable fabric, but it worked very well - Thank you again! Thank you, one of the easiest and best explained tutorials I've seen. It is just gorgeous! You did such a beautiful job on this! Love it! This is a truly beautiful project! We love it! That is the cutest thing. I am definitely going to try this one. Absolutely delightful!! You did a beautiful job!! Love the colors, so girly, just everything is so much fun! I am totally inspired......I have numerous suitcases & this is going to be so much fun!! Thank you!! Fantastic first tutorial! We hope to see many more. Beautifully written tutorial and equally beautiful finished project. Most definitely would like to try this. Lost my comment. 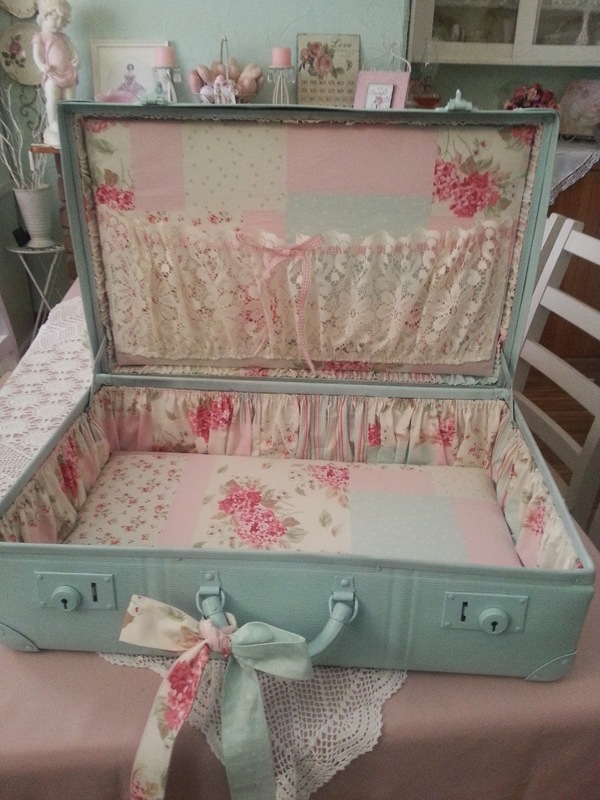 What type of material was the suitcase made out of. I know the old roller skate case would be perfect, but haven't been able to find anything metal. I have my mom's old samsonite suitcase, do you think it would hold the paint? Did you use a special type of spray paint? Thank you for sharing your ideas. Really a beautiful project. I am not sure of the material my case was made from....it is kinda like a really strong cardboard.....I am sure anything can stand up to spray paint....you might just have to use an undercoat on a Samsonite because they are smooth plastic aren't they....and no I just used a regular spray paint ...nothing special. 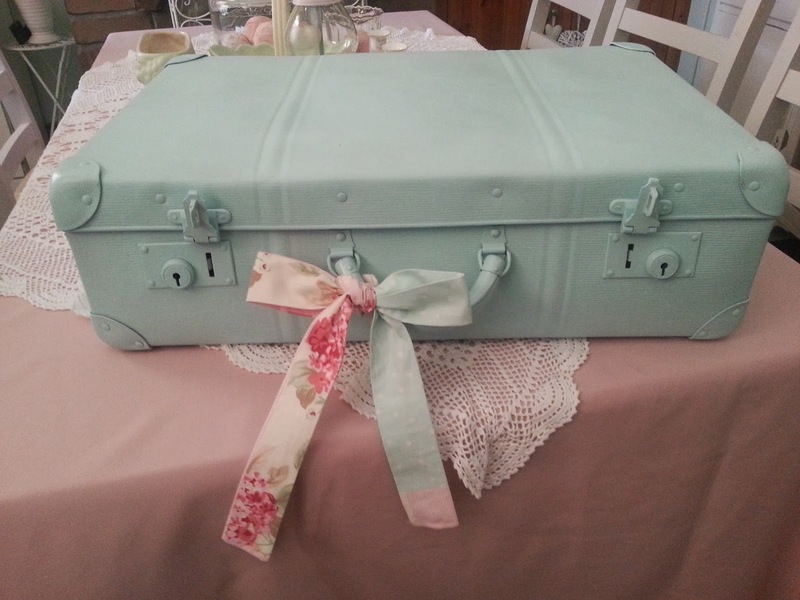 Love the suitcase. I just painted one and am using your lace pocket idea. Thanks for a great tutorial. What about using coragated (plastic) cardboard instead of wood? I'm just concerned about luggage weight when traveling and think wood would add a lot more weight then coragated cardboard. Plus not like anything really heavy goes in suite cases generally just clothes and if the luggage is hard sided ?? Hi Vicky......I am unsure whether cardboard would work as the fabric is pulled quite taut and I would think the cardoard would buckle. You can only try though. My case was made up purely as a display piece and not for actual travel. I would never risk a vintage piece for actual travel as baggage handlers have very litle care for peoples property. Ok I totally agree, but I was thinking it would be a cool carry on bag. Super Cute Bag ! Great Idea! I'm late to the game, having just found your tutorial. How delightful! It looks like something I'd expect to find in an upscale boutique - and I have just the ratty suitcase at home to do something similar. Thanks so much for posting this inspired makeover! I'm so glad to have finally found this! I saw this suitcase somewhere a while back and haven't found it again until today. 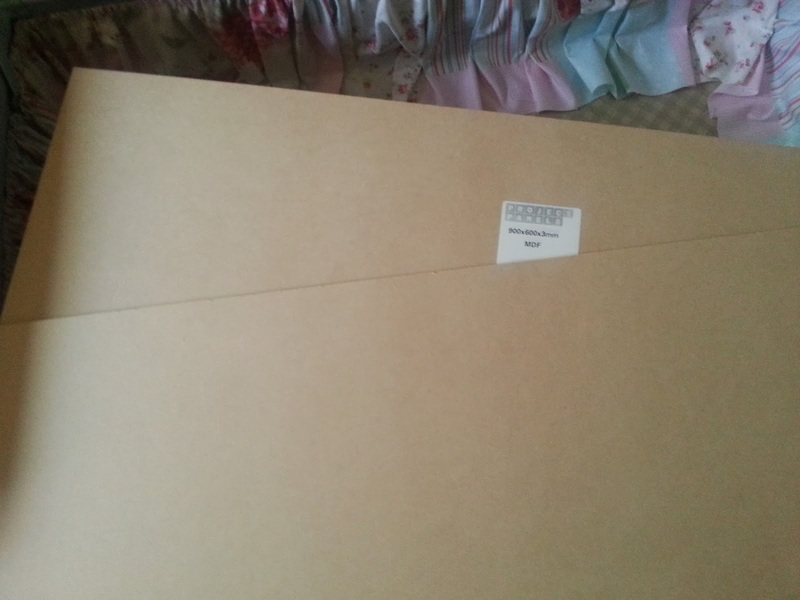 I have a suitcase and fabric but I am not finding book board in a large enough. Can you tell me where I could get some? Your tutorial is awesome and your project is beautiful! My comment didn't post so I will try again. I am so happy to have found this tutorial. I saw this suitcase a while back an haven't been able to find it again until today. Your project turned out beautiful! I have everything but the book board and am not finding any large enough. Can you tell me where I could get some? Thanks! I just love this! Beautiful fabrics. Great tutorial. Thanks for sharing. Someone special is getting one just like this for her birthday. Thank you, thank you, thank you! Looks terrific! Thank you for sharing!! I love how you finished the suitcase. I have done several but not thought to do the bottom using a board. I love it. Much easier. 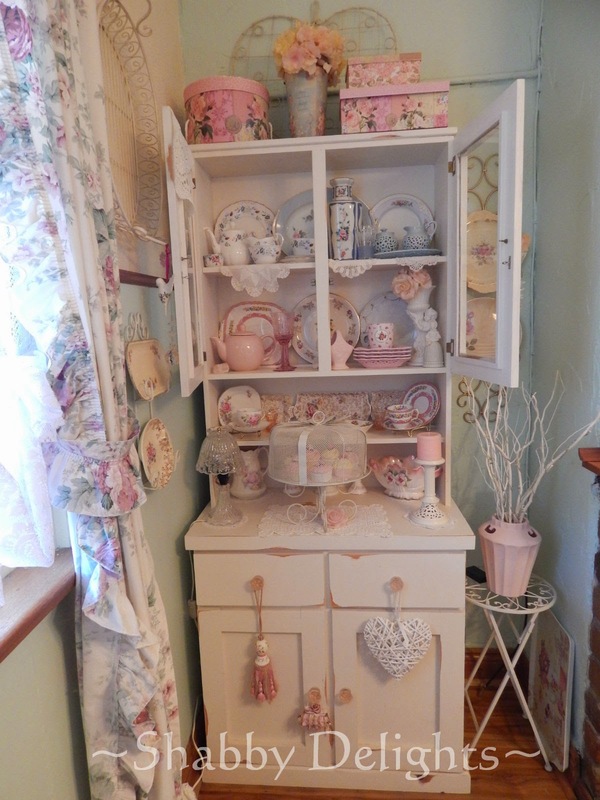 Another wonderful thing to add to the outside would be an image transfer. Just beautiful colors. I truly love this project. However, I am also a silly american, it took me a few minutes to realize that a peg was a clothes pin. Silly me. 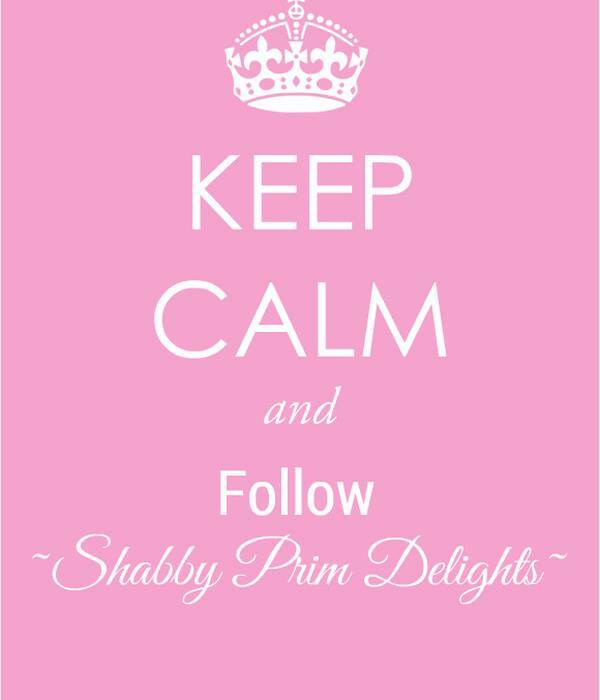 Follow ~Michelle~'s board ~Shabby Sweet 8~ on Pinterest.